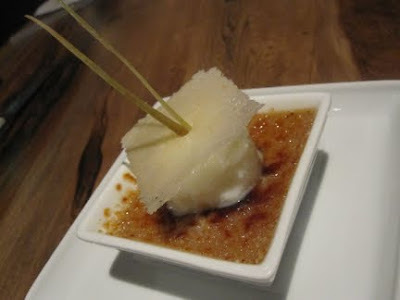 Morimoto Napa: One word: WOW. Update: We've gone back to Morimoto and had a 2nd and 3rd (different) Omakase tasting menus. Photos and all the yummy details coming soon! Update: Michael Bauer (food critic of the San Francisco Chronicle) just awarded a rare 3 stars across the board to Morimoto Napa (for food, atmosphere, service, and overall). 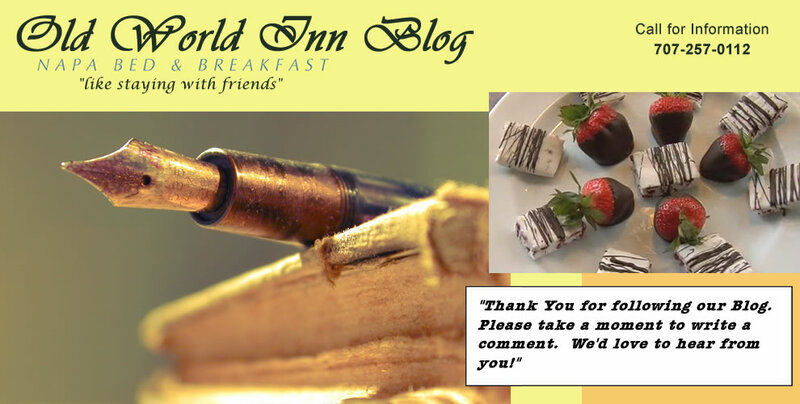 Click here to read his review! Hotel/Inn has its advantages. First and foremost, you can get all the latest info on what's happening in Napa— from both innkeepers and guests happy to share their wine country secrets. Being an innkeeper at a Napa B&B is a lot of fun, too. 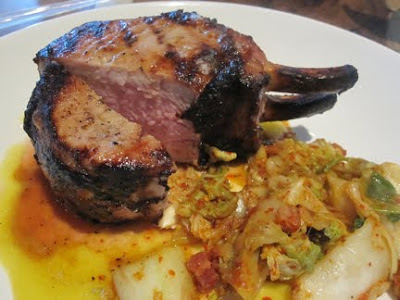 To help our guests, we do lots of research, trying out all the new restaurants and wineries. Hey, it’s a tough life, but somebody’s got to do it. 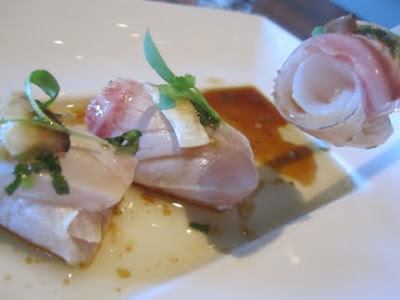 So it was with great excitement that we walked into Morimoto Napa just a few days ago. It's been open less than a week. Normally, we wait several weeks—or even months—before trying out a new restaurant. That’s the kind of time it takes to get everything and everyone “settled in”— so things flow smoothly, and we can experience things at their best. But we were just too excited. Walking up to the restaurant along Napa’s new Riverfront is quite a surprise. It’s hard to believe that a just a few years ago all of this was dirt (and an old boat launch). Now it's a beautiful part of the River Walk, with great views of Napa's new Parisian style bridges and the river (leading to the Oxbow District). 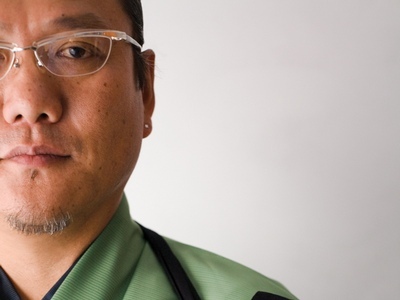 Fans of Morimoto, read on! Have you ever watched Iron Chef and seen Morimoto in action? Besides seeing the fun and excitement, we often wish we were one of the guest judges, sitting there getting culinarily intoxicated. Can you imagine being one of those lucky enough to sample the magic of an Iron Chef? We had to try it! The restaurant itself has a very energetic vibe. This is not a quiet, reflective spot. On that level it has more in common with another new Napa restaurant: Oenotri. The rooms just buzz with excited diners enjoying their meals and good conversation. But that’s where the comparison stops. 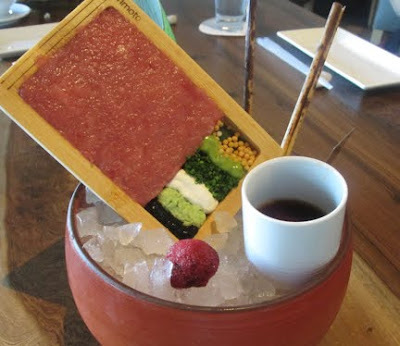 While Oenotri has exceptional food and wonderful, friendly service, Morimoto takes things to a whole new level. 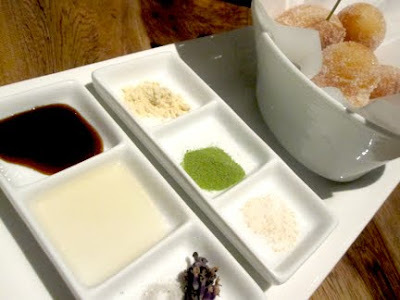 Think French Laundry, with Morimoto’s Iron Chef style, and you’re getting warmer. The menu is nothing short of amazing. We pored over it, page by page, asking lots of questions Our server answered with certainty on dozens of items, with great detail—very reminiscent of our meals at the French Laundry. After considering at all of the mouthwatering delicacies, we were drawn to the very special "Omakase", described as "chef's choice, a multi-course tasting menu designed to allow you to experience the essence of Morimoto's cuisine. $110"
Our server told us it would be 8 or 9 courses (! 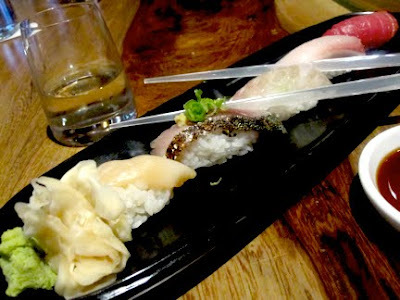 ), and would include both sushi and other heated menu items. The wine/sake pairing was only an additional $45, well worth it for 5 or 6 wines/sakes specifically chosen to compliment the courses. The melt-in-your-mouth Toro tuna was beautifully paired with a White Cottage Rose. We liked it both with-- and without-- the wine pairing. 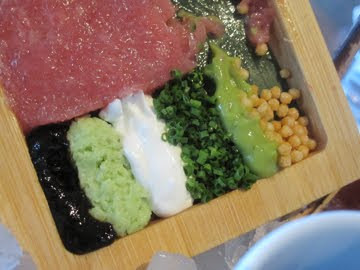 We had lots of fun experimenting with the different flavor combinations-- the nori puree and the tiny rice "crackers" were a delight-- little balls that crunched and exploded with flavor. 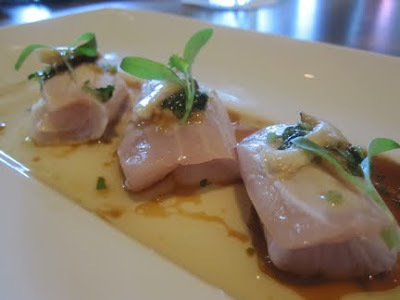 Next course was Kampachi, a beautiful yellowtail fish that we've been dying to try. 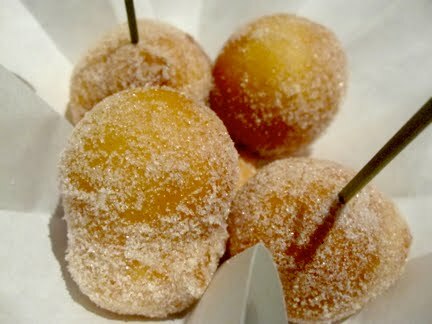 Presented on a simple tray, rolled, with a light ginger viniagrette, it was incredible. The Kampachi was paired with a Breggo Gewurztraminer, which brought out the sweetness of the fish, and the delicate flavor of the mache. Yum! We also ordered a few extra dishes, like the double pork chop (see the image just above the coffee cup photo) and the Beef Curry Bread (which was so tempting we never even got to take a picture of it!). The server also recommended a Junmai Ginjo (photo right), a hand made sake using highly polished rice and fermented at colder temperatures for longer periods of time. This was our first experience with this type of sake, and we were, in a word, stunned. If you like it, you must try it. And if you don't like sake, this may well change your mind. The third course was Bagna Kauda, a dish with a hot well of anchovy oil in the middle (with small flame underneath to keep it boiling). Again, it was all about taste and flavor combinations as we tried dipping the various chunks of meat and veggies into the hot oil. Very unique, and perfectly paired with a Sonoma Cutrer Chardonnay. 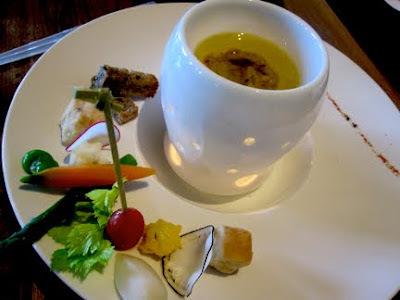 Our favorite combination was the cauliflower, with just the smallest amount of "dunking" in the hot anchovy oil. 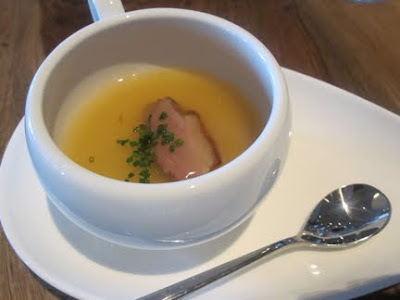 The fourth course was Foie Gras Chawanmushi, which we had seen in Morimoto's The New Art of Japanese Cooking. This is an insanely delectable dish. All we could think of was "umami" (oooh mommy!) -- such a savory, rich flavor. 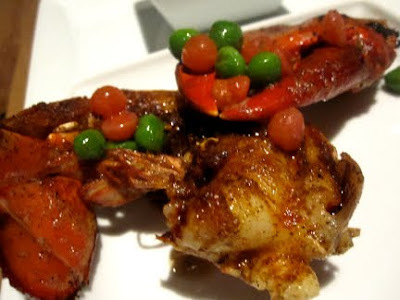 It was paired with a Sequana Pinot Noir-- a perfect choice that didn't overpower the subtle flavorings of the dish. And what a dish! Shanton broth, foie gras, egg custard, dashi-mirin sauce, and roasted duck. A dash of wasabi on the side, to add excitement. The Shanton broth is made with dried longans, citrus skin, and uses fresh ham, chicken thighs, beef shin, and pork neck bones. The custard/foie gras is a work of art. We've never had anything like it. Incredibly rich and savory. Is there such a thing as Japanese comfort food? This is it. 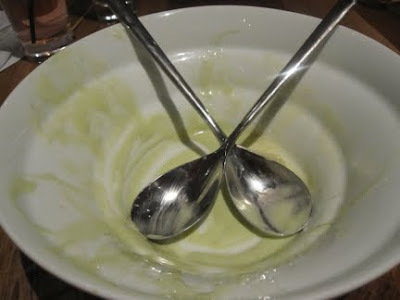 We actually didn't finish the custard/broth. It was just too much of a good thing. And we wanted to save room for the next courses! 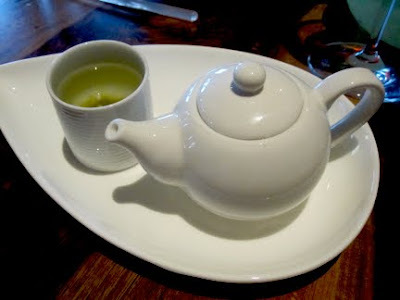 This 5th course was a palette cleanser--a tea made from sea kelp. It was salty and definitely got our tastebuds turned in a different direction! Hotake scallop, saba (mackerel), Hirama (fluke), Hamachi (yellow tail), Chutoro (medium fatty tuna). When guests ask us about sushi, we just say "For us, there are only two kinds of sushi: Great sushi, and not so great sushi. We'll only recommend the great sushi places". With this humbly presented 6th course, Morimoto Napa clearly falls into the "great sushi" category. We'd probably even kick it up another notch higher than any other sushi we've ever had-- not because of the artistry or flavor-- but because of the mind-boggling abundance of sake selections on Morimoto's menu, designed in part to pair beautifully with the sushi. 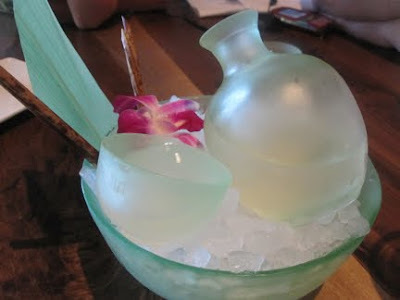 We were served a watermelon ginjo with our sushi selections, and it paired so well, we ordered more sake! We heard this dish said both ways, and thought the latter ("turf and surf") seemed much more Morimoto-- taking traditional things and turning them around! This was paired with a classic Goldschmide Cabernet. With the beef, it was so good, we can still taste it. 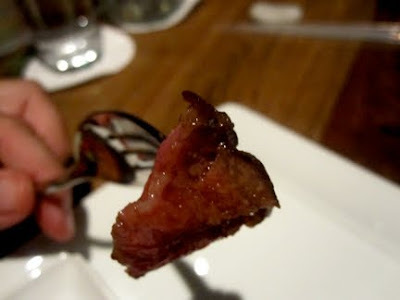 This was our first experience eating Wagyu beef (photo upper right). It certainly won't be our last. Living in Napa, we have access to all kinds of farm raised, hormone free and even Kobe-style beef. 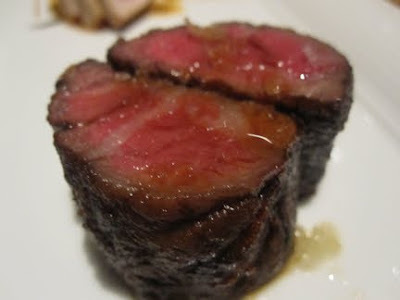 The Wagyu is in a different class. Just look at the marbling (photo close up of fork, right) We've never seen—or tasted— anything like it. The flavor tail just went on and on and on . . . Sometime in the near future, we're going to bring in an ancient bottle of Bordeaux or Napa Cab to pair with Morimoto's Wagyu beef. Given its long lasting flavor, we're dying to find out what this will taste like when paired with a big red that has the same qualities! 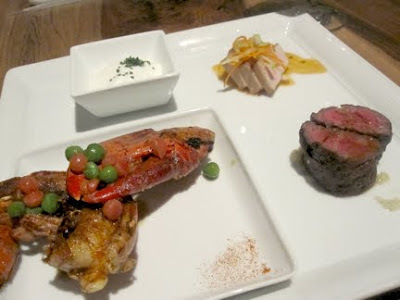 The Turf and Surf had 3 items: The Wagyu Beef with carmelized onions, Lobster Epice with 7 spice blend and lemon creme fraiche, and a pork loin with spicy tofu sauce. The lobster was amazing, with wonderful back-of-the-palette heat. 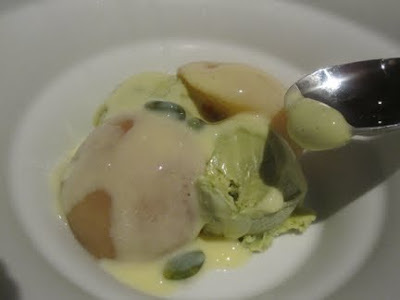 It had such incredible flavor, we preferred it without the delicate and light lemon creme fraiche. Why? Because the flavors were so intense and compelling, we just savored bite after bite. Mmmm . . . The pork tenderloin was also excellent, but we have to confess that the spicy tofu sauce tasted an awful lot like the foie gras custard. That wasn't a bad thing, though. It was divine. So was the Turf and Surf one course, or three? You decide. Yes, it is every bit as good as it sounds. Good manners were the only thing that prevented us from wanting to lick the bowl. You will notice that we used the spoons to good effect! We love the sense of discovery when eating a meal like this. 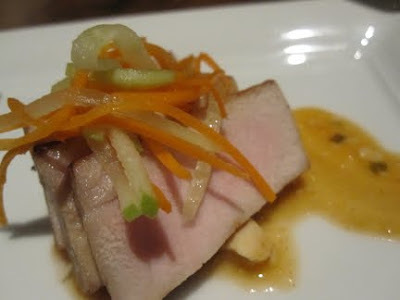 For us, it was all about flavor combinations, as well as food-wine pairing. Like taking your taste buds on a magic carpet ride. Serving size for each course was surprisingly large. Much larger than a typical tasting menu, but not overwhelming. It's as if the chef knew your dining partners would be ooohing and aaaahing so much that you'd have to give them a small taste! It's been nearly impossible to write this review. After writing about each course, our taste buds are reliving the experience, and we find ourselves wanting to get up and run straight back to Morimoto to try something new. We're not kidding. It really is that good. And it's only a few blocks away from our little Napa hotel! If you're staying with us and interested in experiencing Morimoto Napa, we'll be happy to call ahead and get reservations for you. We suspect they will be harder and harder to come by as the word gets out. Why not plan on staying the night? Imagine ending a spectacular meal with a gentle stroll back to your Napa Bed and Breakfast, arm in arm. As you walk back you continue to savor every little thing-- the stars, the cool breezes, each other's company . . .
And when you get back, spend a minute or two by the outdoor fire pit (in summer) or in front of your very own fireplace (in winter). Then drift off to sleep on a featherbed that feels like you're floating on clouds. 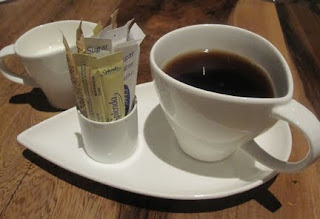 Grano . . .Not just another Italian restaurant! Years ago, we had a favorite Italian restaurant called Belle Arti. It was owned by Santo Sacca and Rosario Patti, with chef Fabrizio Castangia in the back. It had the most amazing vibe. Nestled in beside the creek behind the Opera House, we spend many a romantic evening watching the moon peek through the trees, listening to the creek, the soft chirp of crickets and frogs, and eating the most amazing food. We have vivid memories of the Italian waiters outside by their Vespas, chain smoking and talking a mile a minute in Italian. It literally felt like you'd been transported to a tiny little trattoria in Italy. Incredible. But the reason we went, week after week, was not the ambiance, or the creek, or the waiters. Specifically, a dish called "Pasta Chitarra"-- something so fiendishly simple, yet impossible to create at home (we tried to make it at our inn, for weeks, not knowing the special technique used). So, we finally came clean one night with Santo. Told him we were in love w/Pasta Chitarra, and had to know what the secret was. He smiled, and went in the back. Out came Rosario, who said "So, you want to know how I make Chitarra?" We nodded, eagerly. With great pride, he showed us. To make it, he just sauteed mushrooms and lightly roasted garlic in olive oil, then tossed it with freshly made egg noodle pasta chitarra . . . The pasta/mushrooms/garlic were transferred into a "bowl" made out of a huge wheel of parmesan. 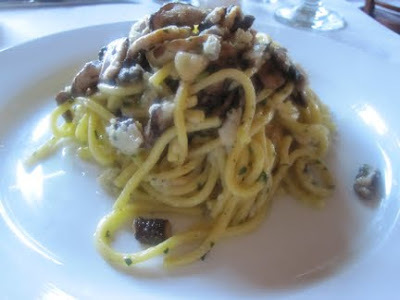 The pasta/mushrooms/garlic were then tossed around until they were completely infused with essence of Parmigiano Reggiano. It was breathtakingly good. Literally the best pasta dish some of us had ever tasted. We went back again and again. Until Belle Arti was no more-- they quietly went out of business. A few years later, we heard about the passing of Rosario, and bid him a fond farewell. Grano (Italian for "grain") opened, quietly, just a few weeks ago. At the helm, Santo Sacca. In the back-- Fabrizio Castangia. The location? The historic old Depot building-- site of a long-time Napa Italian restaurant. The location is terrible. It's impossible to find, hard to park (it shares a parking lot w/a used car dealer, who parks their vehicles everywhere). And it has next to no ambiance, at least outside. Think used car lot, and you've got it. Inside, it's an old building, w/painted walls, slanting floors, and lots of candles. Kinda nice. But not overly romantic. But all of that isn't important. What's important-- for us and hundreds of other Napans-- is the food. Most foodies have favorite hole-in-the-wall places to eat. Little, out-of-the-way spots that no one knows about, w/simple decor and unpretentious owners. Grano is one of those places. Sure, you have to drive along the railroad tracks, through a back parking lot, to get there. Or drive through a used car parking lot, threading the needle through rows of work trucks with sale signs on them. But if you love great food, it's worth it. The menu is simple, but classic Italian. Several dry pastas (not homemade) with a choice of four different sauces (marinara, bolognese, pesto, or butter and sage)-- for only $10-14 a plate. Wine by the glass ($5! ), and many bottles (non-Napa) from $15-25. Corkage only $10, waived with purchase of a bottle of wine. 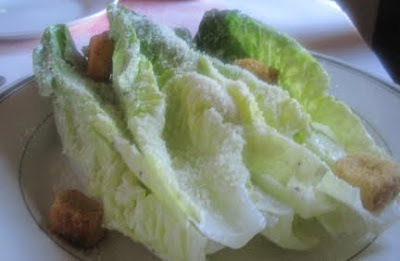 A few simple salads, calamari appetizer, veal and steak secondi. . .
. . . and (drum roll . . .) two freshly made pastas each day. Last night was Ravioli (amazing) and -- Pasta Chitarra. We had it last night, and can say that every single bite was every bit as good, as tasty, as succulent, as we remember. So if you're the kind of person who drives miles out of their way to go to some funky little spot for pizza, or a steak, or any other kind of amazing food, get ready to make a pilgrimage to Grano. But call ahead--- and make sure that Pasta Chitarra is one of the specials. Are we a Napa Hotel? Or a Bed and Breakfast? You decide!